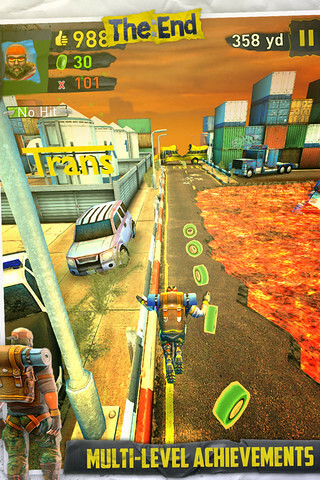 One of the most common type of games released for the iPhone and iPad platform recently is the endless runner genre. Not sure what we are talking about? Think Temple Run. The End App uses the same gameplay but in a very different setting. It’s a free game with awesome graphics and the character does not die instantly (unlike Temple Run), which gives us a longer game play and able to explore further. The End Begins! The world comes to an end; run like hell, collect duct tape and buy goodies for your survival camp. Once the streets are deserted, everything is covered in lava, you are alone, you hear the groove, experience the Collapse and you will know that it has begun. Run! The End App challenges your reflexes, offers infinite game play with progressive level design and multiple environments. Avoid the subway, jump over the burned down police car and reach the hidden duct tape while running in the deserted city. – 3D, awesome, diverse graphics, rich colors. – Unleash crazy Power Ups. 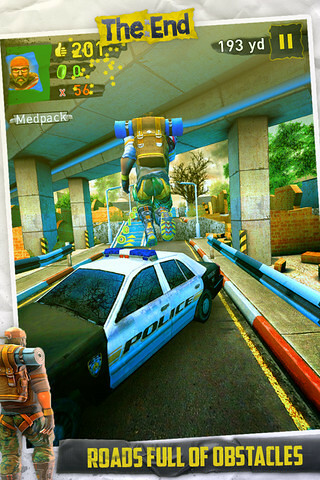 – The game takes you to multiple environments. – There is a big city to explore, with more than 100 levels. – Original music and sound effects and the cool voiceover give the beat. – Compete with your friends through the Game Center Leader board. – Facebook and Twitter share are integrated. – Native retina support at 60 FPS.